It started with some of our COP teaching artists going to the Fabric Workshop for an exhibition. What should our eyes behold but Faith Ringgold’s Tar Beach 2 Quilt! And why would that be so amazing to us? 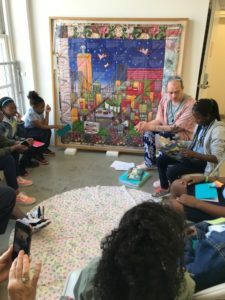 Because our young Emlen artists read and learned from that same book by reknowned African American artist, Faith Ringgold! 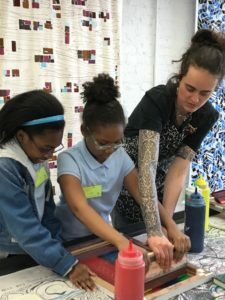 So we reached out to Fabric Workshop and became partners for a magical day at their museum. FW even supplied the bus! 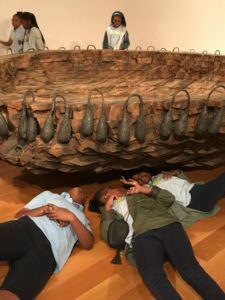 For many, if not all of the kids, this was their first time ever in a museum. They saw the quilt they had studied during the year, read from her book, toured the museum, and participated in a screen printing workshop. Thank you Fabric Workshop! 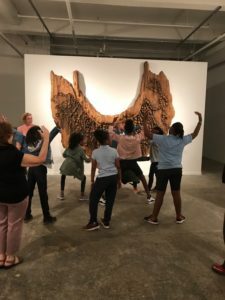 It’s amazing what love for the arts and for kids without access can do. Now feast your eyes on their amazing day. You tell me if they had a good time.